A 1940 incident involving a sulfathiazole tablet contaminated with phenobarbital and difficulties getting the product off the market prompted the U.S. Food and Drug Administration (FDA) to begin requiring drug manufacturers to adopt modern standards for good manufacturing practices. That year, wrote John P. Swann, an FDA historian, the Winthrop Chemical Company of New York began selling the contaminated tablets which led to hundreds of injuries and death. The FDA's investigation of Winthrop revealed significant deficiencies in the facilities and the firm's difficulties in recalling the tainted products. The World Health Organization (WHO) drafted its good manufacturing practices for the manufacture and quality control of drugs in 1967 and it was later accepted by the Twenty-first World Health Assembly. In the United States, Current Good Manufacturing Practices, or cGMPs, are the FDA's formal regulations contained in statutes and agency policies and concern the design, monitoring and control of manufacturing processes and facilities. The addition of "current" reminds manufacturers that they must employ current technologies and systems in order to be in compliance with the regulations. The FDA requires medication manufacturers to adhere to these regulations which provide assurance of a drug product's identity, strength, quality, and purity. Some pharmaceutical manufacturers have established quality and risk management systems that exceed the minimum cGMP standards. Adhering to the cGMPs requires manufacturers to establish quality management systems, obtain high-quality raw materials, establish operating procedures, detect and investigate potential problems with product quality, and maintain reliable testing laboratories. The FDA has the regulatory authority to inspect drug manufacturing facilities plants for compliance with cGMPs. An FDA inspection of a pharmaceutical manufacturing facility includes an evaluation of whether the facility is following the cGMP regulations. Inspections may be random or may be triggered by adverse events reports from the public or industry. If following an FDA inspection, a manufacturer is found non-compliant with the cGMP regulations, the FDA will issue a Form 483 to which the company must respond with an explanation, or if required, steps for corrective action. 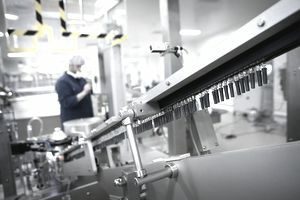 "This formal system of controls at a pharmaceutical company, if adequately put into practice, helps to prevent instances of contamination, mix-ups, deviations, failures, and errors," according to the FDA. The cGMP regulations, guidance documents, and other resources to help drug companies comply with the law can be accessed on the FDA's website, and through the FDA's small business representatives, District Offices, and from the Center for Drug Evaluation and Research, Office of Compliance, Division of Manufacturing and Product Quality. Changes to the regulations and updates to the guidance documents are also published in the Federal Register. While the FDA does not have the authority to require a company to recall a drug when the safety of the drug is in question, companies generally recall voluntarily or at the FDA's request. If a company does not agree to recall a drug, the FDA might issue a public warning about the drug and seize the drugs and have them removed from the market. According to the FDA, "Even if the drugs are not defective, FDA can bring a seizure or injunction case in court to address cGMP violations."